No eggs, just Turkey. Under increasing pressure from Raylan to provide information on Boyd, and Boyd’s increasingly suspicious gaze, Ava stepped it up from last week’s vodka and enjoyed some Wild Turkey 101 for breakfast in this week’s opening scene. 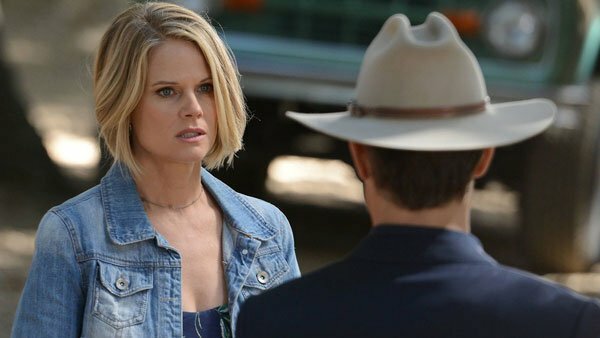 I am really enjoying the final season’s renewed emphasis on the series’ foundational triangle, and I am increasingly impressed by Joelle Carter’s acting chops. Of particular note: The scene in which she confronted Boyd after Raylan suggested that in bringing him the documents “hidden” in her shed, she had walked right into Boyd’s trap. Her explanation – that she had taken the documents because she assumed they were stolen and she didn’t want to go back to prison – was too solid for him to dispute, and her anger was righteous, although we viewers know that it’s the despairing kind of anger you feel when you are caught in the middle of a bad situation. Raylan and Boyd did a similar dance later in the episode when Raylan surprised his adversary on his way to blackmail real-estate man Calhoun Schreier. I love the contrast between Boyd’s embroidered flights of language – or as Raylan put it, his “long-winded, peculiar way of speaking” – and Raylan’s laconic quips. We got a better look at this season’s villains, too. We learned that Garret Dillahunt’s Ty Walker does not like to be called a peacock and that Sam Elliott looks really weird without a mustache. There’s no mistaking that bourbon-smooth voice, however, and his Avery Markham sounds so twinkly and nice when describing how he maintains employee loyalty by overpaying: “Christmas bonuses, Easter bonuses, Presidents Day bonuses, Pappy Van Winkle on their birthday.” Don’t get too comfortable, though; his idea of punishment for betrayal goes well beyond an eye for an eye – try both eyes and a bullet. But what is the deal with those land deeds, and why were they worth stealing? We get a clue when Ava visits Boyd at his bar to reemphasize her loyalty. Sipping on a pour of Buffalo Trace – straight, no ice – she drops another nice Kentucky reference by telling Boyd she doesn’t care if he hides gold bricks from Fort Knox under her bed, she just needs to know what is going on. And one thing she knows is that one of those land deeds is to Pizza Portal. At this, Boyd declares her a genius and says he’s going to get “the good bourbon” to celebrate. I’ll see you next week. Until then, here’s something to ponder: What would Boyd consider “the good bourbon”? Elmer T. Lee, or something else? What do you reach for on special occasions?